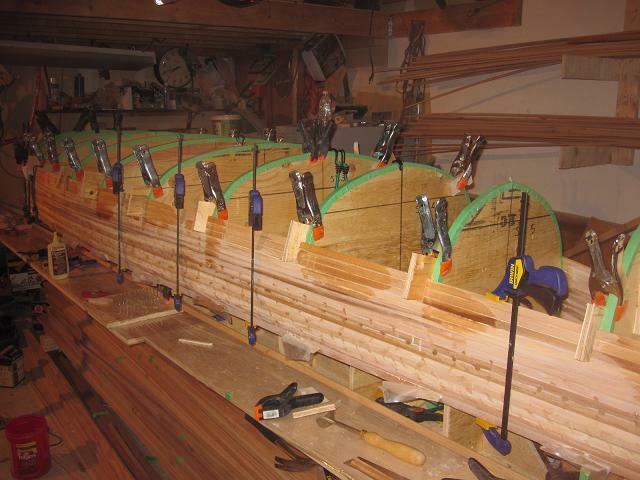 canoe widow [kuh-noo wid-oh] -NOUN The partner of a canoe builder whose recollection of his/her spouse is prompted by a whiff of sawdust that emanates from the garage. After what seems like an eternity of stripping, the football is now filled. The children will now have to do without the tedious and vaguely distressing jokes (and associated mental pictures) of their father-as-stripper. I got ahead of myself a little and started planing and sanding parts of the hull. The left side of the picture above shows how smooth the hull will eventually look against the roughness of the right side of the hull. 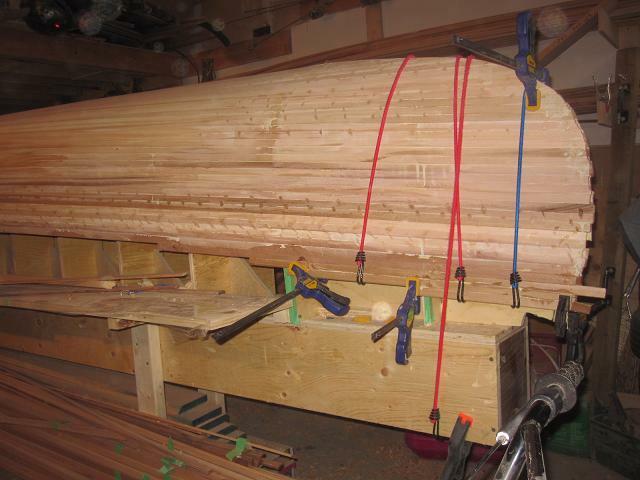 There are minor gaps to be filled, but overall the strips are tight and level. But there are a few details to complete before I turn my attention completely to planing and sanding. 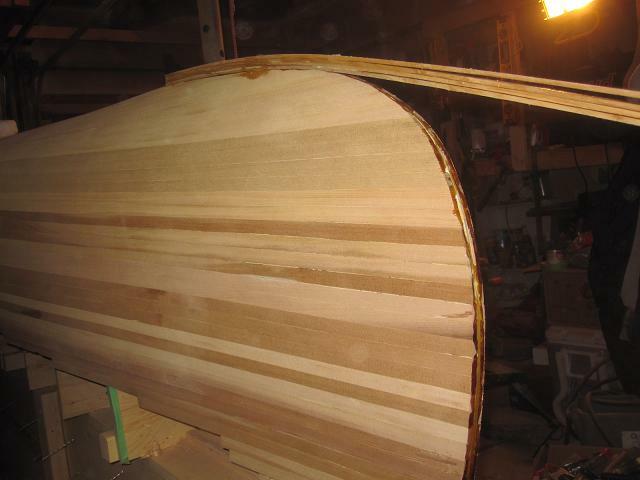 I’m using some of the off-cuts from the main portion of the hull to fill in the bow and stern of the canoe. 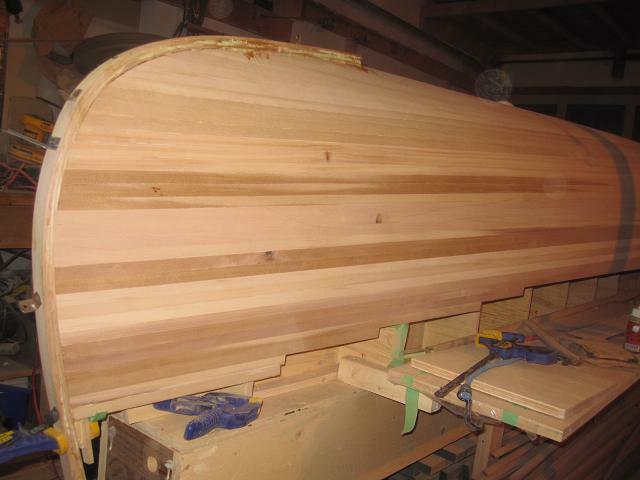 These shorter pieces will be shaped after glassing the outside of the hull for form the upsweep of the bow and stern. Once I have these pieces in place, I’ll be able to form the outer stems, but that’s a topic for another day. Today, I’m taking out a canoe widow. 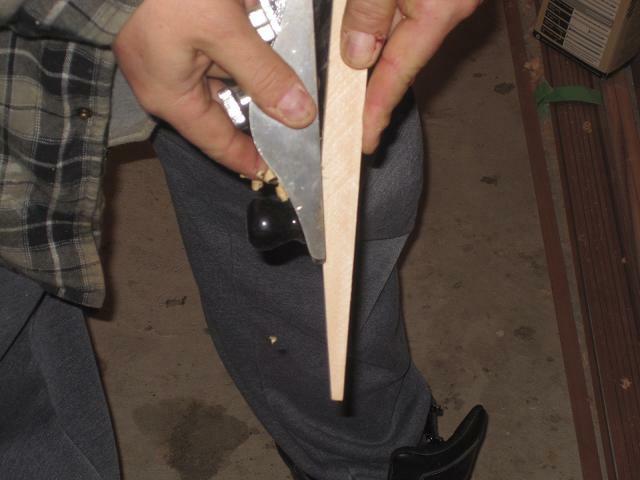 Canoe building factoid #1: You spend half your time looking for that thing that you just had in your hand. 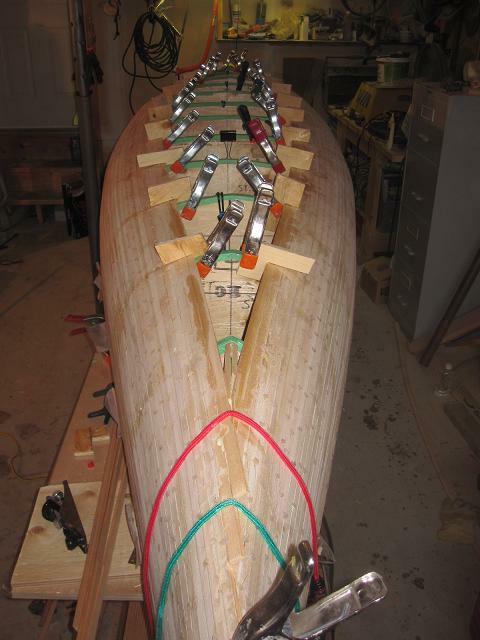 Canoe building factoid #2: That thing that you want is always on the other side of the boat. Filling in the football. The stripping has gone quickly and without any of the problems that can arise. From time to time I measure from the edge of the center strip to the edge of the side strip. The last thing I want is to have the last strips on either side to look different. As fun as the stripping has been, I can’t wait to get to the next phase of the project. 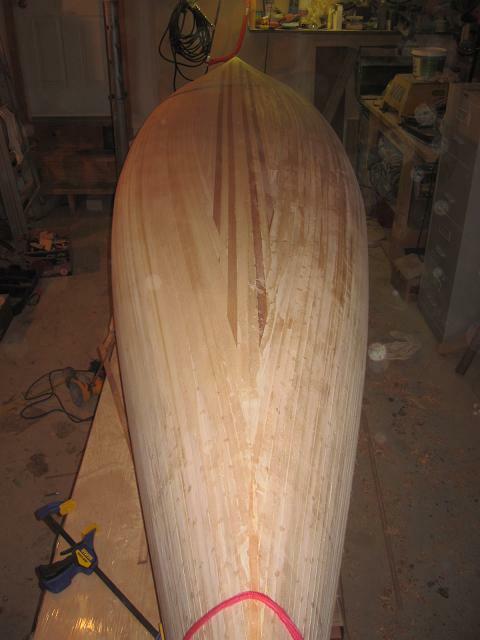 I can taste the sawdust that I will be creating soon when I start sanding the hull. There are a lot of acute angles. I’ve found that the best way to pare the wood away is with a block plane. It takes about 20 seconds to rough in the angle. If I’ve marked the angle correctly, the test fit will reveal that the strip fits tightly. Otherwise (and is normally the case), I have to fine-tune the angle. Either way, the block plane does quick work and you end up with a neat little pile of gerbil bedding. Doghouse [dog-hous, dog-] -noun The place where canoe builders go for neglecting their household chores. A quick post (before I vacuum and do the dishes). It was a very productive weekend. I’ve run the strips to the point where I’m left with what is known as the football (for reasons that are evident in the picture below). 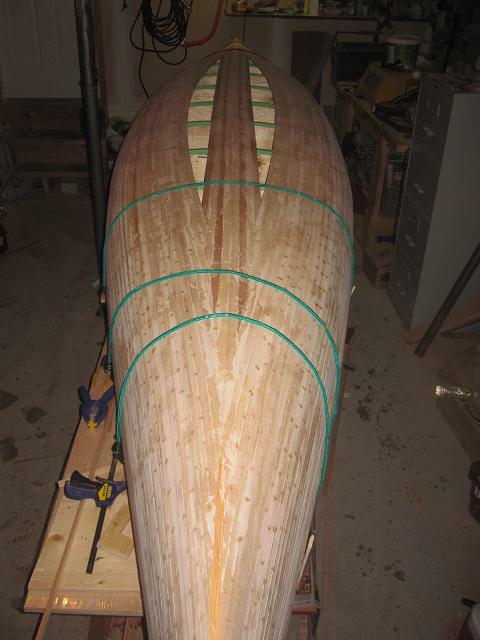 Here’s a picture of the canoe in profile. So I’m left with a decision as to how to fill in the football. I’m leaning toward running a pair of strips down the centerline and then filling the halves with a herringbone pattern. That’s something I’ll have to consider while vacuuming. In the foreground, you see a spring clamp with an “L” bracket made out of plywood. This is my favorite clamping method, as it keeps the strip tight against the form and allows pretty good pressure to keep the strip in the cove of its neighbor. 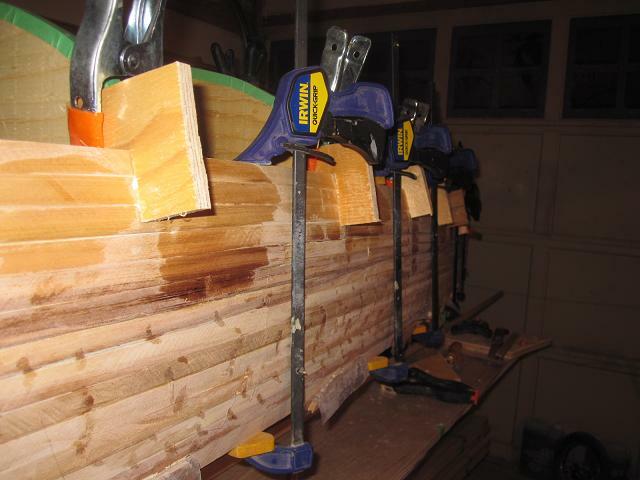 For pesky strips that need a little more force to keep the strips mated, I use bar clamps. 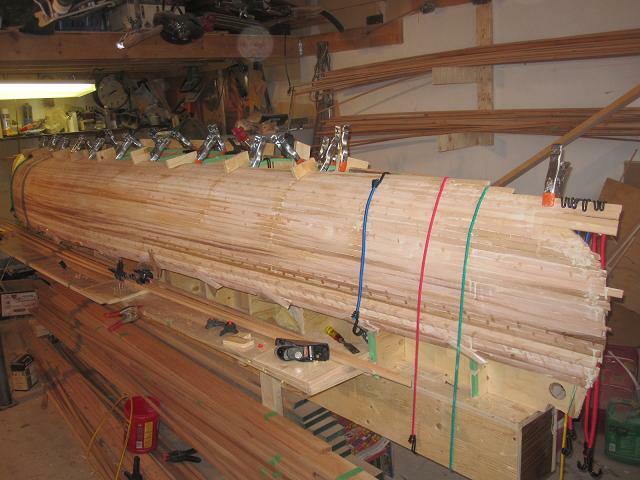 These clamps have very good strength, but too much force tends to make the strips bow out from the station form. 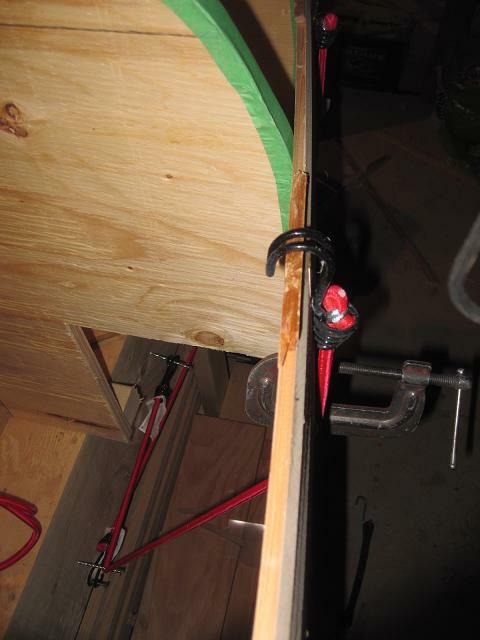 Note that I use the bead from a scrap piece of wood when using bar clamps and bungees to protect the cove. The dots, by the way, are hot melt glue residue that will be sanded off. Actually, those unsightly blobs are hot melt glue. 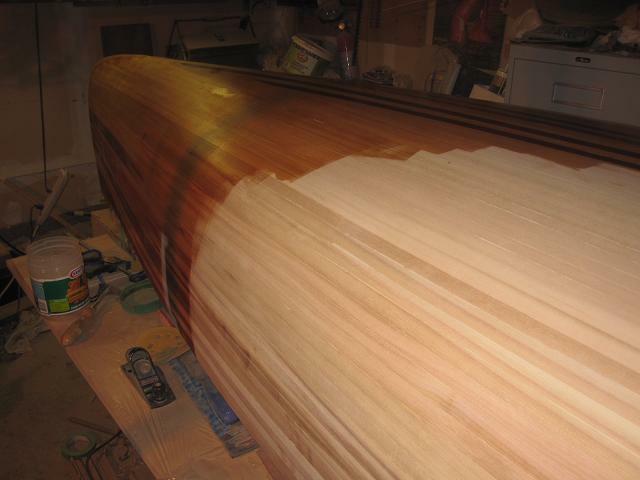 Essentially, I glue and clamp the strips, and then apply hot melt glue between the strips on the outside of the boat. 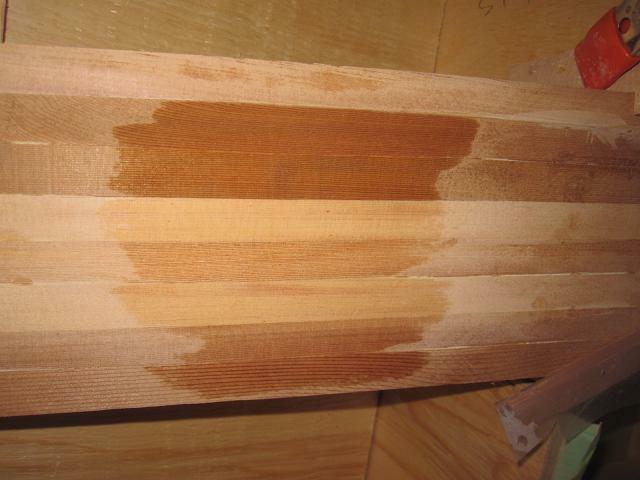 The hot melt glue keeps the strips together while the wood glue cures. In this way, I can move on to the next strip without having the previous one move around on me. All in all, I prefer this method to stapling the strips to the forms. One caveat though is that the strips will have a tendency to bow away from the station forms when you clamp them (particularly when using bar clamps). Of course, if I’m doing just one strip, I glue it, clamp it, and leave it. I can then scrape off the blobs of hot melt glue and the resulting surface (after a bit of sanding) looks none the worse for wear. And no staple holes! The darkness, by the way, occurs when you wipe the surface down with a damp rag. I was just curious about the final color of the boat. 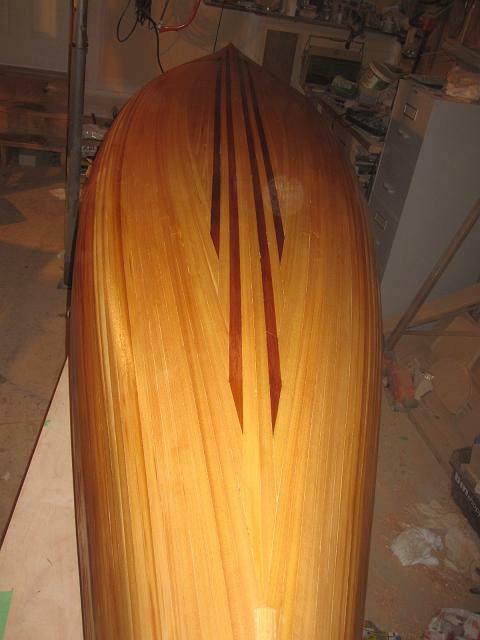 You are currently viewing the archives for February, 2011 at greybeard canoes & kayaks.